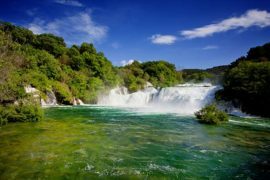 One of the most pleasant ways to visit Albania is from Corfu. The scenery is dramatic as you approach a country once off limits for a half a century. 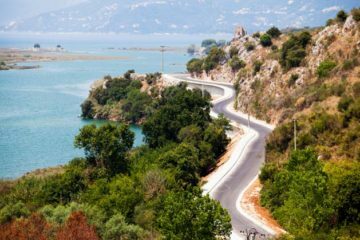 Think of the visitors to Corfu, who for years could only gaze at the distant mountains and wonder what lay “over there.” Visitors to Corfu can now have an opportunity to actually see what is in Albania and enjoy the beauty of the unspoiled coast. 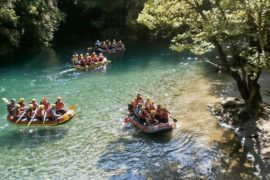 On this program you can really get a feel for scenic southern Albania, north up along the coast to Vlora and then south inland to Gjirocastra. Visit Albania’s most important archeological site, Butrint. According to legend, the city was founded by ancient Trojans who fled Troy when it was destroyed by the Greeks. After your visit, sample the fresh seafood of Saranda and enjoy the beaches on the pristine Ionian Sea. Please note: Kutrubes Travel can arrange for hotel packages in Corfu and the round trip ferry tickets to Albania for your convenience. 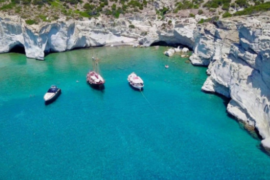 We can also arrange all other types of programs in Greece. 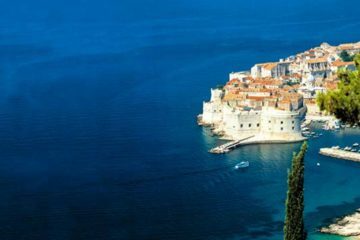 This tour operates with a minimum of 2 and a maximum of 10 travelers. Other rates available on request. Arrive in Saranda from Corfu. Meet your English-speaking guide and transfer to the Hotel Butrint. After check-in, continue the drive south on the scenic road to the archeological site of Butrint and enjoy lunch at local restaurant. Continue on to ancient Butrinti, dating back 2500 years. In the ruins itself visit the Amphitheatre from the 3rd century and the temple of Aesculapius. The Baptistery from the 6th century has colorful mosaics and is one of the largest baptisteries east of the Adriatic. Bustint’s ancient acropolis is on the top of the hill overlooking the entire site and affords an impressive view of the area. The old fortress houses the new small archaeological museum, which contains recent finds from the site. Butrint is truly one of the last unspoiled natural and ancient historical areas in the Mediterranean. Return to Saranda. Dinner and overnight at Hotel Briliant. 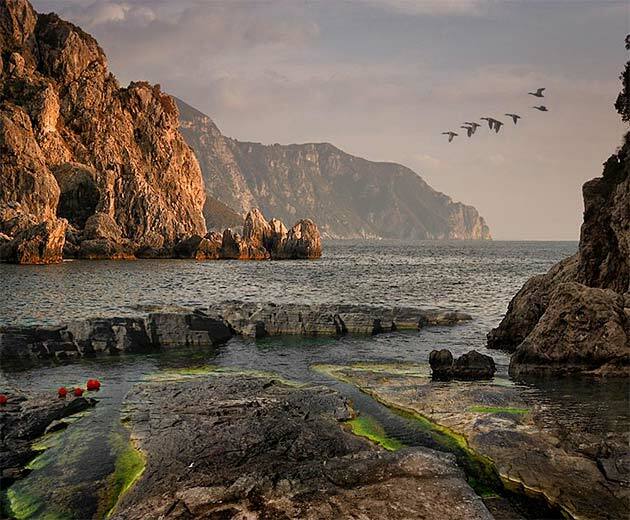 Depart for Vlora traveling north along the Albanian Riviera. En route we pass the castle of Porto Palermo, located near Himara, also known as the castle of Ali Pashe Tepelena. Our drive north passes through many beautiful villages like Lukova, Borsh, Qeparo, Himara, Vuno, and Dhermi, which all have very beautiful beaches. Lunch in a local restaurant in Himara or Dhermi Beach. For a dramatic change in scenery we drive high up into the mountains to Alpine Llogara Pass. After leaving Llogora we return to the coast and arrive in the city of Vlora. Vlora is one of Albania’s largest cities and a major seaport and tourist resort. We visit the Museum of Independence, which commemorates the proclamation of Albanian independence on November 28, 1912. Independence Day is one of Albania’s most significant holidays and marked the end of centuries-long Ottoman rule. Dinner and overnight at the Partner Hotel in Vlora. In the morning depart Vlora to Fieri, where we visit the Apolonia Archaeological site and have lunch at a local restaurant. 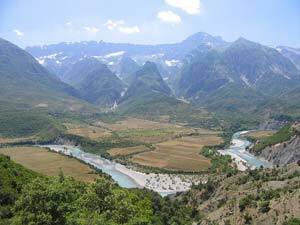 Continue on to Berat and en route visit the Ardenica Monastery and a local winery. In the afternoon visit the Old Quarter, the icon museum of Onufri, Albania’s master iconographer, and other highlights of the city. Dinner & optional lunch. Overnight at Hotel Mangalemi in Berat. In the morning depart Berat to Gjirokastra taking the inland road, and journey about 3 hours south to the “Museum City” of Gjirokastra. Lunch at local restaurant. Visit the fortress, which stands high above the city for a panoramic view of the beautiful mountainous landscape and Ethnographic Museum. We leave Gjirokastra and pass by the “Blue Eye,” a natural spring and an ideal spot for a picnic by the deep blue natural spring. We arrive in Saranda for dinner. Overnight at Briliant Hotel in Saranda. After breakfast departure from Saranda’s port to Corfu.